What do we do when wi-fi booms? We’ve been able to use free computers and Internet as a selling point for library services over the past few years. It has led to an increase in patron visits for most libraries and continues to be a major service provided for many patrons. Overall, the only major problem patrons have with Internet usage in libraries is the ability to customize the computer to their liking (i.e. download/update software, files, etc.). Wi-fi is a nice addition as it allows patrons more access to more content and the ability to download software without having to worry about the library policies and security settings. Considering the latest drop in laptop prices and the rise of the netbook, wi-fi is becoming a major sell for many of our patrons. But what happens when wi-fi becomes commonplace? The affordability of laptops and other wi-fi enabled devices becomes more negligible each day. Just this past weekend the Trenton-area circulars advertised laptops for under $200. Wi-fi cellphones may still cost a bit right now but two years down the road, when it’s time to re-sign your cellphone contract and get the free upgrade, don’t be surprised is wi-fi is standard or available on the lower end models. Even personal gaming systems have wi-fi capabilities; no upgrades required. The point is, the ability to access wi-fi is already here, the thing holding it back is where to find free wi-fi… and that is quickly growing. This past week, my family and I took a vacation to Deep Gap, North Carolina. Don’t feel bad if the name doesn’t ring a bell, its major selling point is that it is in the middle of nowhere and hard to find. That said, the recreation center had free wi-fi for all visitors and residents. The Burger King we stopped into to let the girls burn some energy on the playground also had free wi-fi for all its customers. As a matter of fact, we probably had more difficulty getting a good cellphone signal than we did finding a wi-fi signal (this was certainly the case in the Blue Ridge Mountains). Many companies, social organizations and eateries are finding out what most libraries know; free wi-fi brings in more people and that means more sales. Going to Google and typing in “Free wi-fi New Jersey” pulls up several sites dedicated to finding free signals. Some of the sites even catagorize the signals by establishment (restaurant, hotel, spas). I’m happy to say that libraries still seem to be the leader of free wi-fi areas for most of these sites. What I Learned One Weekend — thanks to Twitter! More and more often it seems that Twitter is becoming my de facto “source of all good bits“. Having all but abandoned my bloated RSS reader a few months ago, I find now that Twitter is filling that desire to keep up with what is going on in the world of libraries, technology and beyond. I know that many still question the validity of Twitter and others have written it off as simply a place where people share what they had for breakfast. I, however, find it a place where I can get quick links to topics that interest me and keep me current. More than 90% of those I follow are librarians or techies and I purposely keep my following list to a limited number so that noise ratio is never too high for a quick scan to cherry pick the good stuff from the stream. When I have time, I join in on the conversation and that is fulfilling too. This past weekend I spent quite a bit of time inside due taking care of a sick child. I decided to do a little experiment and make a list of all the really cool and/or educational bits that I encountered over the weekend from Twitter. How I Find the Very Best of the Web : Very useful tips for keeping current, several of which I plan to put in to practice! Twitter for Libraries : As someone who has given similar workshops and who also maintains the Twitter account for MPOW, I found this list to extremely valuable. Why Teresa is so proud to be a Romance Writer : I am not a genre reader in general and romance fiction is not something that I have ever read at all. This thoughtful article brough a tear to my eye and made me appreciate the value of this often maligned genre. In fact, I think I might try reading a romance or two thanks to this article. Who is Copying and Pasting Your CC Content? Discover More with Tynt’s Tracer Tool : The title says it all in this case. Getting Boys to Read : I actually read about a dozen articles from this site over the weekend. This is a topic near and dear to my heart as my 5 year old son begins his reading journey. So far he is loving reading and doing well, I just want to make sure we stay on track and the articles on site will do just that. Teen Podcast: Episode 7: I am loving the new video format of these podcasts from Justin the Librarian at Cape May County Library. The three questions format works well too and the 5 minute length is perfect. Well done! Want! The Orb, a bluetooth headset that turns into a ring : I love gadgets and jewelry. Nuff said. The 50 Greatest Gadgets of the Past 50 Years: Interesting reading for the gadget lover — and brought back lots of nostaglic memories of gadgets gone by. Talking Points on Library Use : This was not something new to me having used it in the past, but it did remind of several good statistics that can be used when talking about the importance of public libraries (especially crucial at this juncture for many libraries and many states). 100 Things Your Kids May Never Know About : The world of technology continues to change at a rapid pace and this article from Wired drives that point home. I really do believe that it will not be long until most children will not even know how to use a road map or atlas and/or use a print encyclopedia given the current usage that these two items get in our reference collection. Giving up my iPod for a Walkman : A teen boy experiments with using a first generation Walkman. 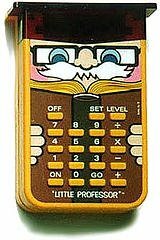 I had a device just like the one he is pictured carrying (which means I am revealing just how old I really am…yikes). Screenjelly : I have experimented with ScreenToaster as a free online service for screencasting, now it looks like the toast will be getting competition from some jelly. I plan to test this out soon. Amazon, Zappos and Libraries : In this brief blog post the point is eloquently made that for libraries … ” the future isn’t in content, really…it’s in service.” I could not agree more. Basically, this is just a random sampling of what types of things I discover and learn on Twitter on any given day. I would love it if others shared a “good bit” or even two that they discovered recently thanks to Twitter (or FriendFeed or Facebook or any other social networking site). I would like to thank those that I follow for providing me with such good links and food for thought on a daily basis. My learning is enriched every day by my “tweeps” — feel free to give a shout-out in the comments and lay claim to the link from your orginal tweet if I posted it above. I found out about this video from Sophie Brookover via Facebook. Sophie reports that she is planning to run the race — and perhaps even throw the race all for the cause. I love it when a clever fundraising idea is promoted so brilliantly and I hope that this will be a huge success for Brett Bonfield and the teens who need a space to hang out at the Collingswood Library. Click here for more info on the 5K Race and Collingswood Book Festival. UPDATE 7/28/09, 3:00 PM: Check out Jenny Levine’s post on changes coming to ALA Connect–esp. regarding improvements in notifications! I’m excited, hopeful, and joyously optimistic about ALA Connect, ALA’s hybrid social network, bulletin board, listserv, calendar, project management tool. I’m appealing to you, dear reader; help ALA Connect thrive and grow by logging in and turning on your notifications too–and help spread the word by posting this attractively designed and competitively-priced banner ad (in both border and non-border stylings you’ll notice) on your blog, homepage, or social network of choice. Extra points for tattooing directly upon your body. No pictures please, I’ll take your word for it. I’m in Chicago in order to attend what must be my 20th American Library Association annual conference. I have lost count of how many annuals I have attended. My first was Los Angeles in 1983 when my family began accompanying my mother, who is also a librarian, to the conference for our summer vacation. LA was just the first of many other conferences. I also went to Dallas, New Orleans, New York, Atlanta, San Francisco (a couple of times), Chicago (also a couple of times) and several others that I have since forgotten. ALA meant only one thing to me when I was growing up: free stuff. I looked forward to the seemingly endless rows of exhibits that promised loads of goodies to bring home. At first one of my parents would accompany me up and down the aisles but I was eventually allowed to walk through the exhibits by myself. As long as I met my parents at the previously established meeting time, I could spend as much time as I wanted looking at all of the books. At the time, it never occurred to me that I might one day attend the conference as a librarian. Not long after I started library school in 2002, I asked my mother (as I did every year) if she was going to attend the annual meeting in Toronto. After she replied that yes, she was planning to attend, I remember imagining yet another experience of walking up and down the exhibit aisles filling my bags with swag. Then it slowly dawned on me that the upcoming conference would be an entirely different experience–I would be attending ALA as a soon-to-be-librarian. I would actually have to go to meetings and presentations! My experience in Toronto was completely different from any of my previous conferences. I spent a lot of time walking or riding the bus from one meeting to another and I barely had time to go to the exhibits. People sometimes say that they find ALA overwhelming and before attending my first conference as a librarian, I didn’t really understand what they meant. How could a place full of free books be overwhelming? Toronto thoroughly disabused of this idea. Just figuring out which meetings and presentations to attend can take quite a bit of time and energy. Now I am once again attending ALA in a new role. As a doctoral student, only a few of the meetings mesh with my particular research interests. This means that I feel quite a bit of pressure to attend all relevant meetings even when they are scheduled at the same time. I am constantly looking at my printed schedule to make sure that I don’t miss anything. The exhibits are, of course, secondary. Before becoming a librarian myself, I had no idea that there were many librarians out there who were quite disappointed with ALA and its work. My mother always seemed recharged and energized for her work after attending a conference. Of course, this is the essence of some librarians’ problems with ALA. What does one get out of being a member other than the conference? For me, being a member of ALA reminds me that I am part of a larger community. Before returning to school, I worked in a small theological library — a setting that is very different from a public library. By reading through my American Libraries every month, I was reminded that even though my library had a specialized mission, we were still part of the wider library world. Now that I am a student again, I feel even further removed from librarianship. Attending this conference has helped me remember why I am in a library and information science doctoral program. 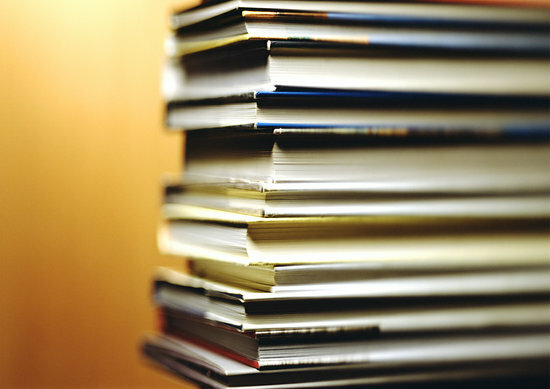 When I am in the McCormick Center, surrounded by 27,353 other librarians, I recall that my research is not just for my own edification but that it will also aide the profession as a whole. By attending the conference, I am reminded that even though I no longer work in a library I am still a librarian. I still have one more day of running around the conference center to attend meetings and racing through the exhibits. And, like my mother, I hope to return to New Jersey from this conference recharged and energized for my classes in the fall. Are you like me and have a pile of books you’ve gathered this year and haven’t had time to read? Will you get to them all this summer? Maybe you participated in the summer reading program at your Public Library as a child and loved all the incentives, prizes and competition. I was a fixture in Mary Jacobs Library in Rocky Hill each summer. That’s where the pattern of a summer reading plan started. I’m hoping that even just writing about this is the incentive I need to start finishing more books each summer. I’m excited to see that Adult summer reading programs are popping up all over. Library websites and Facebook pages allow the programs a great online presence and wider audience. I may have found the answer to my summer reading dilemma. For me, summer seems to be the perfect time to catch up on reading- At least in theory. As a school librarian, I have my summers free (well, I’m using that word loosely- Those that don’t have summer jobs like most of us are free, that is) from my full-time work. So, every year, when school gets out in June, I set out with a noble plan to read hundreds of books before Labor Day. • Gather reading lists, YA, Adult, and non-fiction. • Gather the piles of books I’ve gathered at ALA and BookExpo that I plan to read and then give away as prizes or promotion at school. I start my first summer book with high hopes and optimism and often finish it right away, then I get 2 or 3 going, eventually getting distracted by a fourth and next thing I know, I’m sitting on the beach in mid-July with unfinished books in my beach bag, and enough frustration to last until Thanksgiving. 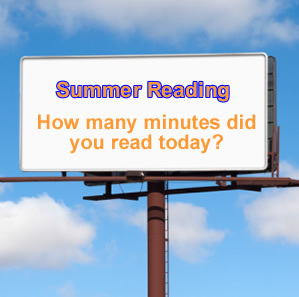 Would a summer reading program designed for busy adults help? I think so. Don’t you get more done on a day when you have several things scheduled? Time and project management are essential to my productivity. It sounds rigid, but I end the day much more satisfied when I accomplish more. That’s why I think summer reading program for adults are worth promoting. When I make my reading plan in June, I never factor in that I’ll be doing outdoor activities every sunny day, traveling as much as my job allows, repairing my house, cleaning my garage, taking care of family, and generally just trying to get enough energy back to start another school year in September. Sometimes I need the freedom from so much “input/output” that goes on during the year that reading another “heavy” book in the summer might not be what the doctor ordered. When did my reading excuses become so “adult”? 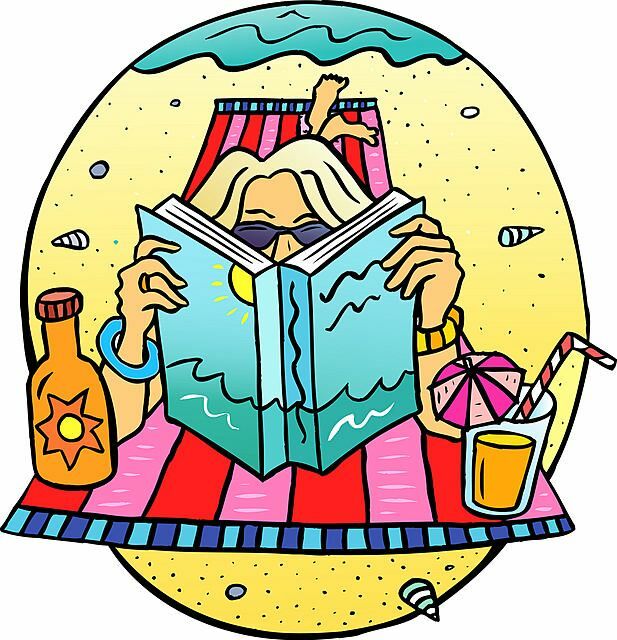 Gerie Madak posted this quote in reference to Bridgewater’s Adult Summer Reading Program, “Too often adults deny themselves the pleasures of reading for fun. They’re so busy taking care of everyone else that they begin to regard reading as a self-indulgent pastime they don’t have time for because of chores, appointments, and deadlines.” I’d like to find the happy medium between the guilt of not reading and the gluttonous satisfaction of reading more books than someone else. These programs aren’t designed to be competitive, they’re more like open book clubs for the summer months. So, in creating this post for LG in early July, I’ve decided to stop being so hard on myself and celebrate each book I do finish OR start! I’ll do more walking, yoga, and reading for pleasure. Unlike my students, I don’t HAVE to read a certain number of books to complete a summer reading project. Unlike the summer reading program I promote in school, I won’t win a prize for reading 100 hours at my public library (that’s changed in many places and I honestly did not know that until I started researching for this post). Since I began writing this, I’ve learned about some great adult summer reading programs. Like a book club, I think it’s great to have deadlines and discussion when you’re reading. The prizes are cool, too, don’t get me wrong- like restaurant and movie gift certificates, and of course, books! I’d love to know more about dynamic summer reading programs for adults, and if you have your own plan that you’d like to share. Teaching Generation M handbook–"hot off the presses!" I am especially happy to announce this publication on the Library Garden (LG) blog, since four out of the eight senior contributors to LG were willing and able to take time out of their busy schedules to write chapters within the handbook: Amy Kearns, Karen Klapperstuck, Tyler Rousseau, and, of course, myself. I know that I also speak for lead editor Vibiana and our project development editor at N-S, Sandy Wood, when I say that we sincerely appreciated the hard work and diligence of all our two dozen-plus chapter authors. We hope that you find our handbook about working with and devising quality educational resources for “Generation M” – today’s group of teens and young adults born in the early 1980s through the mid-to-late 1990s – to be interesting and helpful.